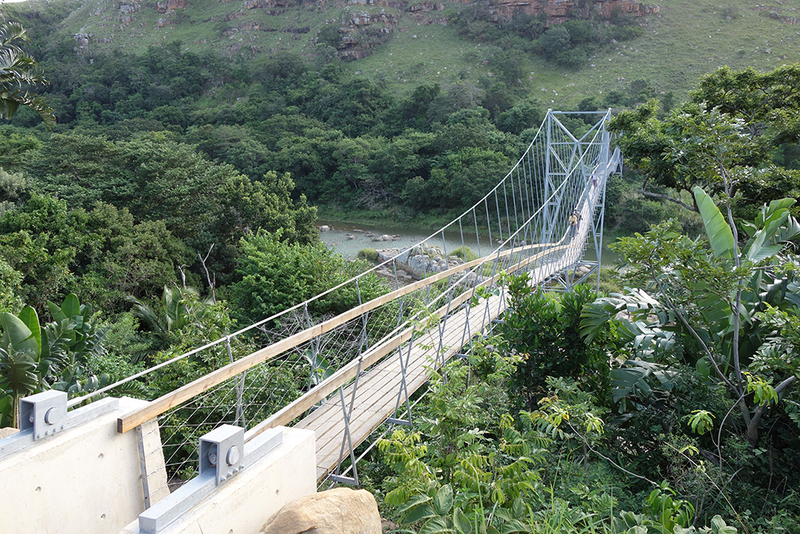 The project bridgingMZAMBA starts with the local population’s desire for a safe crossing over the river MZAMBA in South Africa. The river now separates the inhabitants from necessary local infrastructure such as educational facilities, health care and general food supply. Each year several kids are drowning on their way to school and medical care can’t be reached in time. In the rainy season, when the water level of the Mzamba River is high, the whole community is cut off and inhabitants can’t reach the other side. 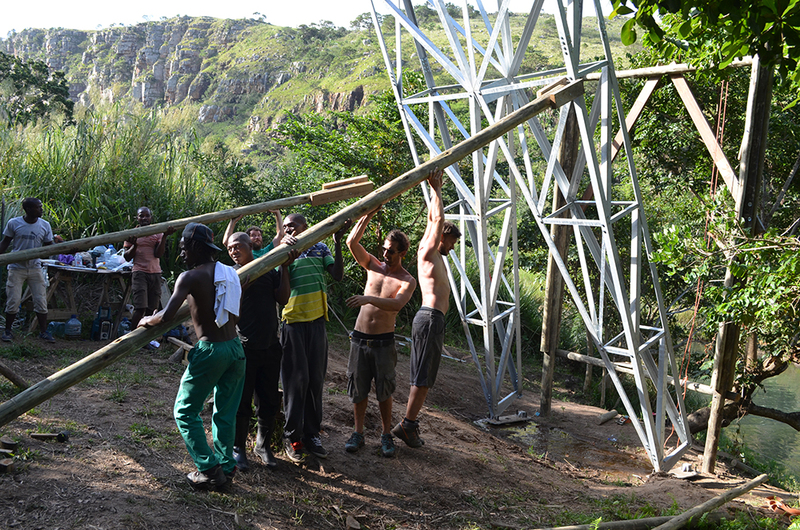 Due to the difficult accessibility on just one site of the valley all parts of the bridge needed to be carried to the site manually. Therefore the whole bridge is designed to arrive in parts and assembled together with mostly unskilled local inhabitants. The design itself started with a thoroughly survey of potential locations to find logical contact points like an ideal geological rock formation. That reduced the amount of concrete casted with local riversand. The precise positioning of the pylons have been carefully evaluated, because an increase of span results in higher forces and more material whereas the current situation leaves the section of the river undisturbed. The geometry of the pylons are designed in form of a frame-work consisting L-shaped angles, have been assembled on ground and put up with human power. Due to the most critical aspect of lightweight suspension bridges – oscillations – a system of prestressed cables is developed to increase the stiffness considerably, making the bridge as if it is made of heavier material. This process of prestressing piece by piece creates on one hand the arched walkway geometry and leads furthermore to a fascinating construction process: The whole bridge develops out of itself, all components that are necessary for construction are also part of the finished bridge.